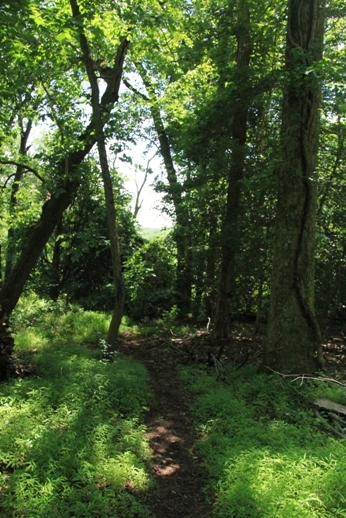 Distance: 0.2 is the shortest (the Nature Trail) to many, many miles if combined with the trails in the rest of the park. 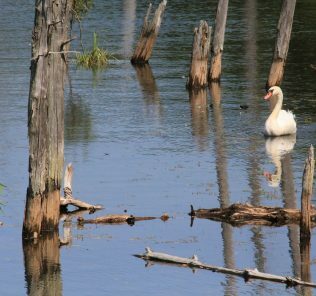 There are three miles of trails in the Nature Center, and an undetermined number of miles of trails in the State Park. The Pres and I did a bit more than 2 1/2 miles. 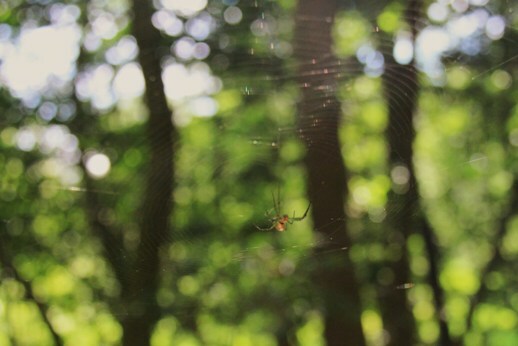 NOTE TO BIKE RIDERS: Mountain biking IS allowed in the State Park, but is NOT allowed in the Nature Center area! It’s easy to tell which is which, because you must cross a bridge or a stream to get between the two! There should be No Biking signs at the boundary, but apparently they have been removed several times. 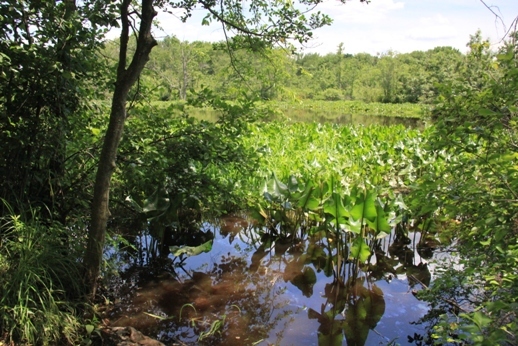 Terrain: hills, meadows, forests, swamps, Rancocas Creek… pretty much a bit of everything. Map: Click here for an interactive map of the area. It doesn’t have all the trails we hiked once we left the nature center (they were blazed, just not on this map), but it has a ton of great info. GPS track of our adventure. 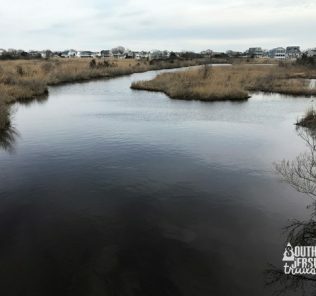 Westampton, NJ 08060 or 40° 0’11.84″N, 74°49’15.17″W. They have a parking lot there. 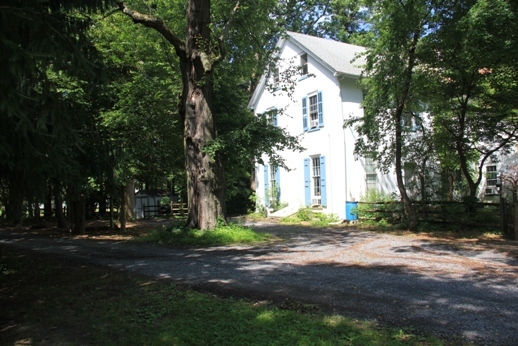 Entrance from Rancocas -Mt Holly Road. Markings: Many blazed trails. Inside the Nature Center section of the park, we used the yellow, red, blue, and orange trails. 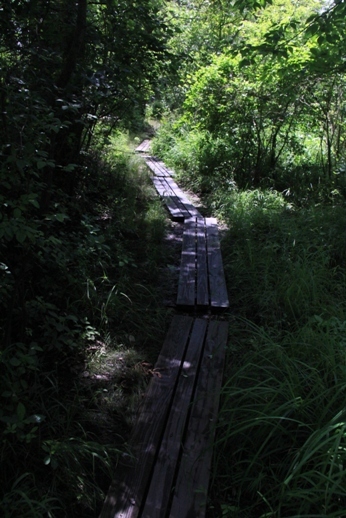 We also took the side trail off of the blue trail that crosses the footbridge into another section of the state park. We had no map here, but did parts of the yellow and brown trails. We had to turn around before reaching the end of the yellow trail, so I’m not sure where it ends up. 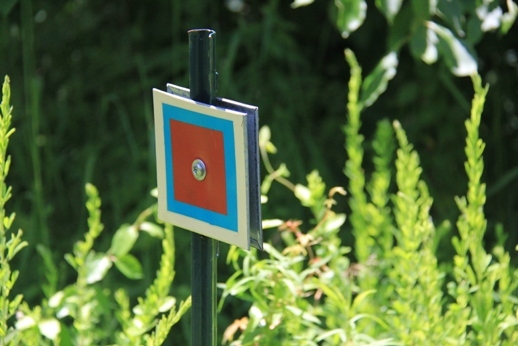 Sample trail marker. Also marked on trees. 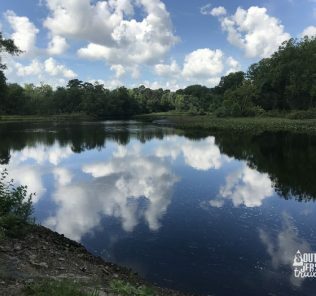 Description: The Pres and I started off our summer right last week by taking a trip to Rancocas State Park, a place neither of us had ever been. We did this upon the recommendation of Kevin and jerzger, we set out to explore this park located on the very edge of the pine barrens. 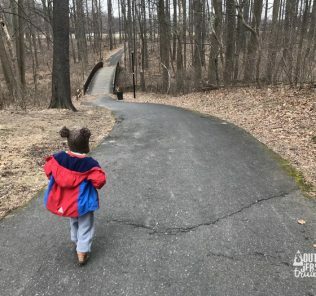 We were told that a great place to start is the Rancocas Nature Center (formerly run by the Audubon Society, now on its own), so we decided to park our car there. We went into the center and the friendly guy behind the desk gave us a map of the trails within the nature center part of the park and explained our options. Make sure to stop in, and leave a donation in the box for the good work that they do there. Nature Center building from the parking lot. 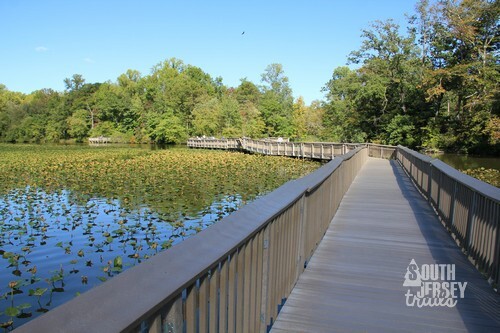 There is another great reason to walk over to the nature center: the trails start there off of their porch. 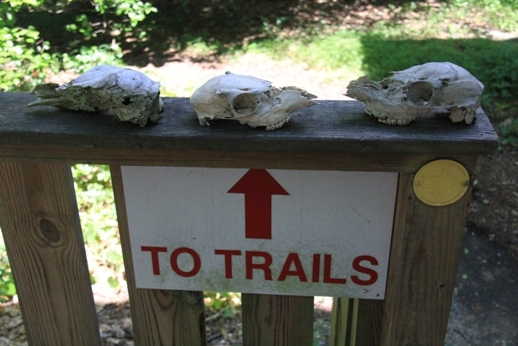 Skulls = always a great start for a trail. 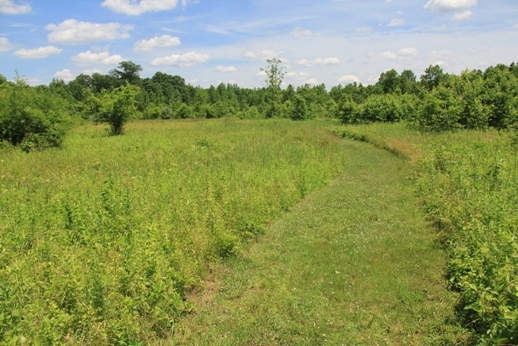 The yellow trails (which you start on) is a very short nature trail. Don’t get attached, because you’ll soon be at an intersection where you will turn left onto the red trail. The red trail, which is really just a mown path, loops for 0.4 of a mile through a lovely, sunny meadow. Some of the trails were a little wet from the large amounts of rain last week, but the puddles were able to be detoured around. 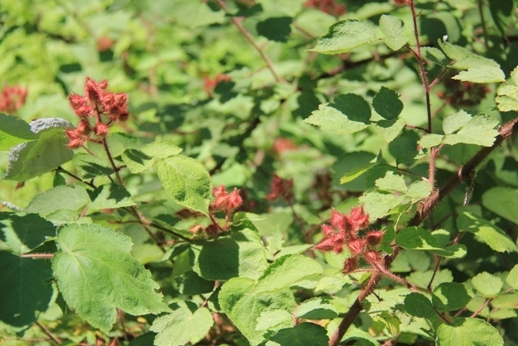 Keep an eye out for birds, flowers, and insects. Someone thinks its funny to steal Daddy’s hat. 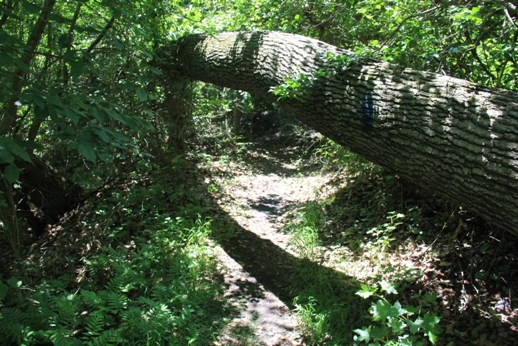 This is what the red trail looks like. The red trail eventually comes to a T intersection with the blue trail. 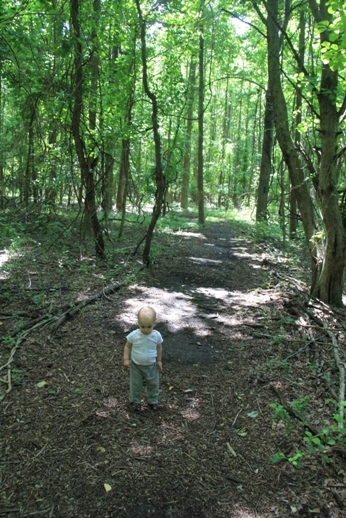 Right will head back toward the nature center. Left will take you deeper into the woods. Needless to say, we went left. 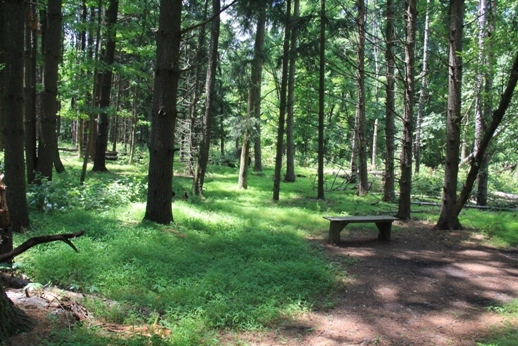 The blue trail is heavily wooded and shaded with lots of huge trees, a welcome break after the heat of the meadows. 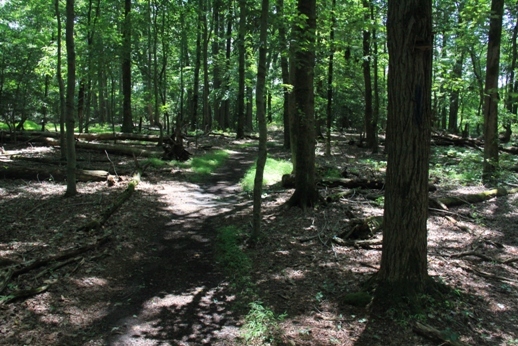 After being on the blue trail a short time, the orange trail splits off to the left. 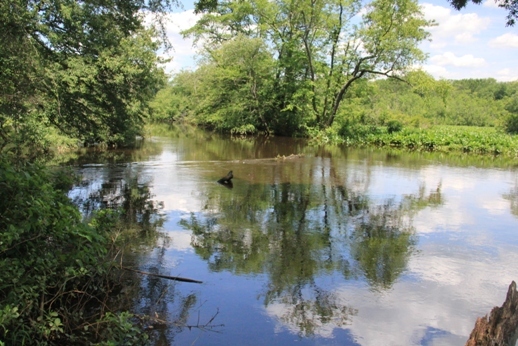 This is a 0.25 mile (one way) out-and-back-spur to Rancocas Creek. We had been warmed it was too muddy to hike after the rain, and I had opted for sneakers rather than boots. So, of course, we took it anyway. The mud was bad, but there were options to get around it the whole way, and the view of the river was well worth the dirt. Helping keep my feet dry. 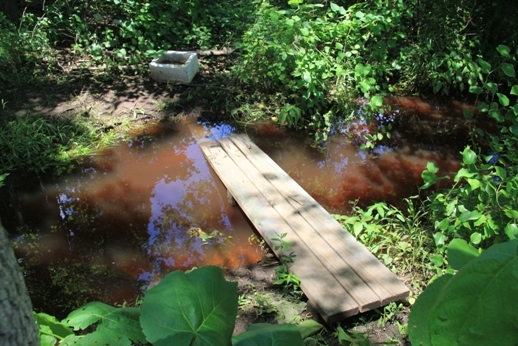 A way over a flooded out section of trail. 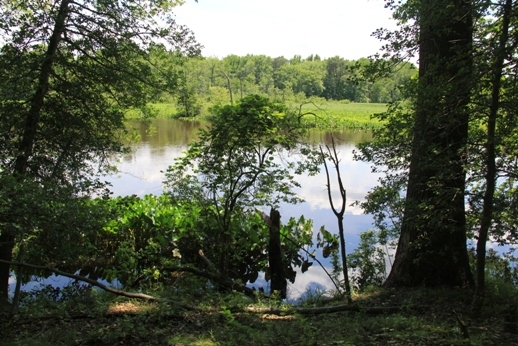 Final view of the creek. 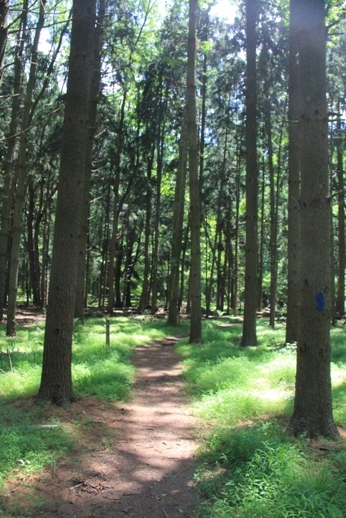 At the end of the orange trail, you need to backtrack down the trail to the blue trail. Head left on the blue trail to continue on to where you haven’t seen. There are some tricky little bits of trail here, including a duck down that The Pres almost didn’t make it under. Almost didn’t make it under this one together. Just after nature marker #13 on the blue trail, another trail splits left and crosses a stream. This takes you out of the nature center section of the park. 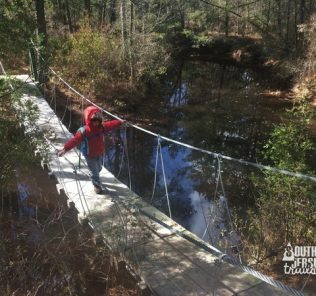 We didn’t have a map of this spot, but we decided we needed a bit more hiking, so we crossed the bridge into uncharted territory. 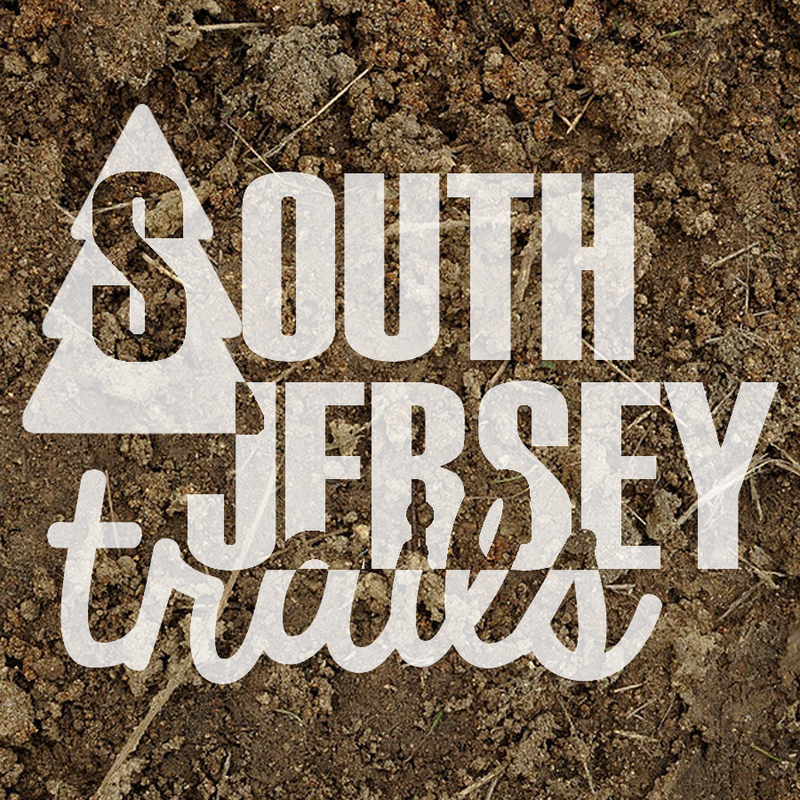 The trails immediately goes three ways. 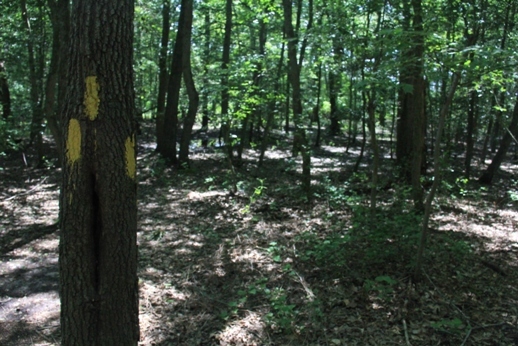 Right is the Brown Trail (which we walked a few hundred feet on), straight is a non-marked trail, and left is a different yellow trail. 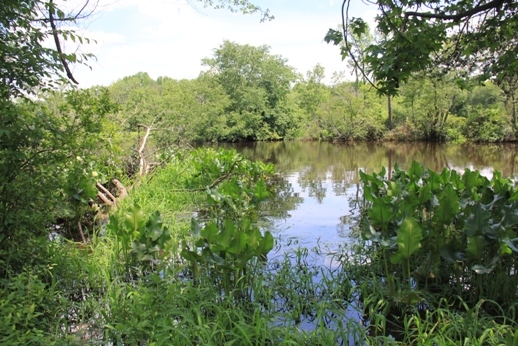 We decided to head left on the yellow trail and try to get some more glimpses of Rancocas Creek. This section of trail goes up and down a bunch of small quick hills, emerges at the creek, and then more or less parallels it for a while. At this point, The Pres began to be viciously assaulted by some biting insects, so we decided to turn around and backtrack to the bridge. 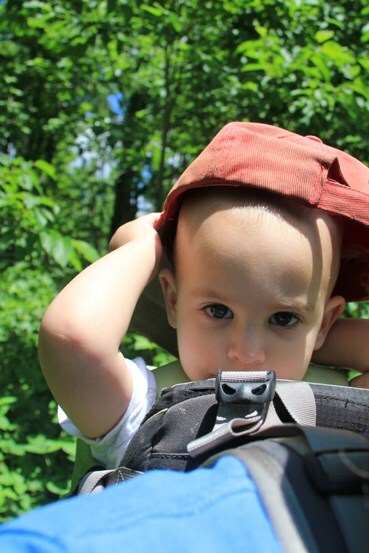 We’ll be back when it’s less buggy. Also, we saw a spider. Back on the blue trail, we pressed forward. I let The Pres down to get some hiking in himself, and we walked the 1/4 mile or so back to the parking lot. Our journey was only interrupted by what I think was a turkey, which had a bunch of babies following close behind. Bad picture of the mystery bird. The Pres walking down the blue trail. We ended up coming into the back end of the parking lot, where we headed home for ice cream and cat cookies. 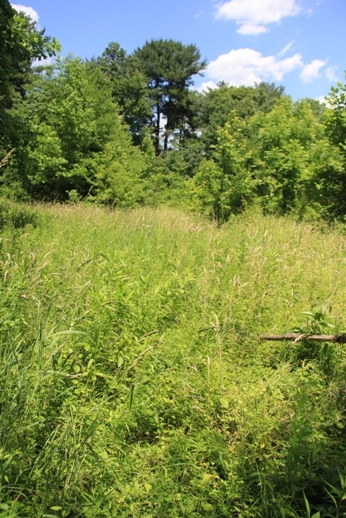 Outstanding meadow walks, lovely mature forests, very nice views of Rancocas Creek. Great set of trails! 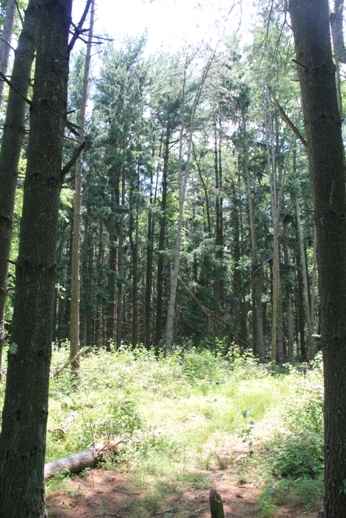 Lots of secluded woodlands with a variety of areas to explore, and potentially miles of trails that we haven’t walked yet. There is also the greatly reduced Rankokas Indian Reservation that I have never visited. We will absolutely be back to do some more hiking. Thanks to you folks for having such a great organization! Please feel free to link wherever you’d like to and/or to use the pictures. I don’t have any suggestions for making the place any better, I really liked the layout of the trails. Maybe more skulls at the beginning? Thanks Scott! We really enjoyed it, we’ll definitely be back soon. 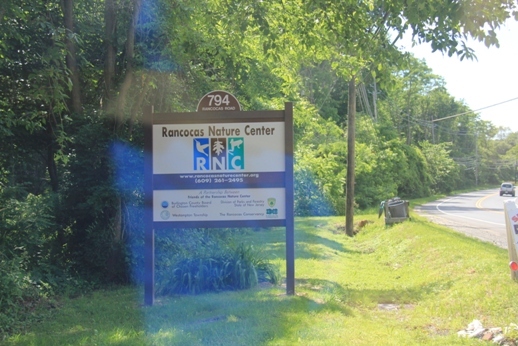 I noticed that it’s right down the street from the Boy Scout offices, so I plan on using that as an excuse to do a lot more exploring at Rancocas. 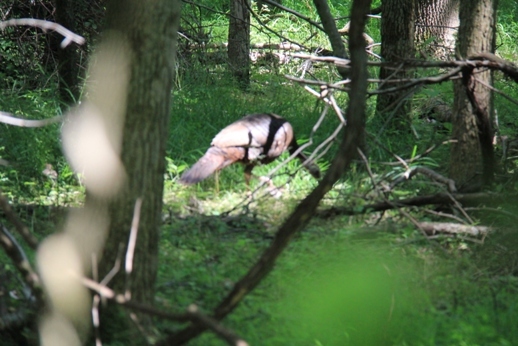 Your mystery bird looks like a hen turkey. Thanks Dave! I’m bad with birds. I can do seagulls, roadrunners, and burrow owls, and that’s about it. Nice job Mike,its funny or maybe not. I have lived near the park for the last 40 years and when i say near im real near. Today was my first day i ever visted the park. What a gem. Really enjoyed it. Your blog is right on. 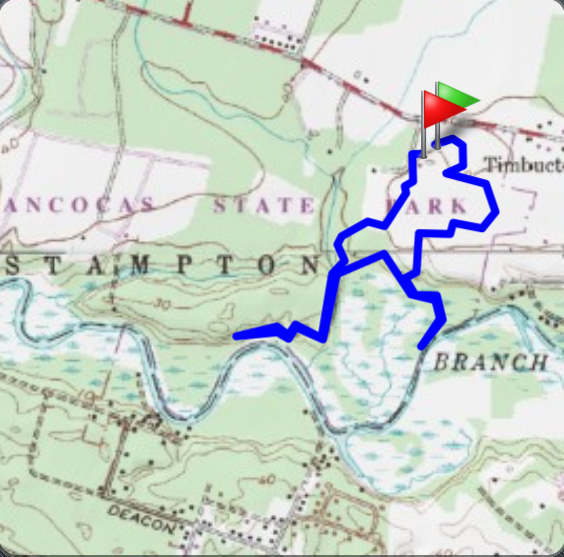 My partner and I walked the larger loop on the Indian reservation side of the rancocas state park. Nice day to stretch the limbs. Wondered what plans the state has for that neck of the woods? Haven’t heard of any plans for anything! 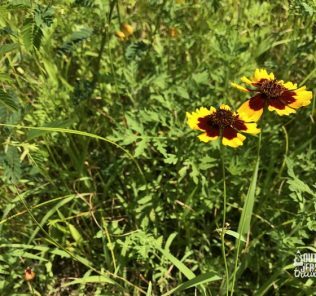 Good wildflowers. Spring Beauty and Mayapple in early spring. In May, mountain laurel and Blue Flag Iris down by the creek. 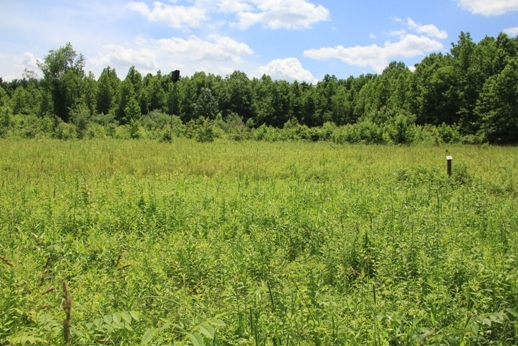 Cardinal flower, swamp azalea and more in late spring and summer.